We reviewed MySims Racing last month, and I was really wanting the experience to be more like this one. I'm saddened by the fact that the game is coming out in 2010 and not this year. The Overlord has commanded his minions on all major gaming platforms minus one. We'll be taking a look at the Wii installment of the Pikmin-like franchise with Overlord: Dark Legend. The Wii remote seems to be a perfect controller for some types of games. We've seen some form of creature-calling action with the New Play Control version of Pikmin, so why not look into what's considered the evil version of Pikmin with the Overlord series? Both of the numerical installments of the Overlord games have wound up on HD platforms, so with the DS game, this is the first time the series has hit a Nintendo platform. 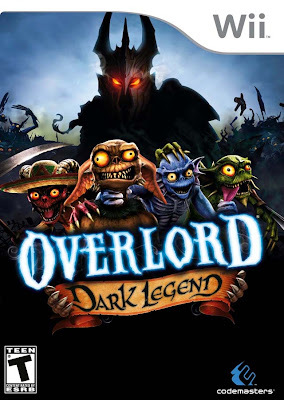 It's Overlord: Dark Legend for the Nintendo Wii. Overlord: Dark Legend is intended as an origin title for the other two HD Overlord games. You start as a weak and gutless boy, son of the king of Gromgard, taking orders from your bossy brother and sister. When you get a magical glove on your 16th birthday, you find a castle door that can be opened with it. Inside, a ghoul of sorts give you a foreboding suit of armor and a quartet of monstrous minions that follow every order you beckon. The rest of the story pans out how you become the ruler of Gromgard leading the way towards Overlord I and II. As the newly crowned Overlord, you do not need to get your own hands dirty. You're above that! Of course, you can lend a hand and smash up stuff with an axe or sword, but why do that when you have an army of minions to do your bidding? There are four varieties of minions, and you begin with just the standard grays, the offensive line of your ferocious force. As your proceed through the game, you'll unlock new varieties such as the fire-throwing reds who can inhale walls of fire blocking the way, the water-loving blues which won't drown in la aqua like the other minion types, and the noxious-breathing greens who can use stealth to defeat enemies, and breathe and remove poisonous gas from paths. There will be points in the game where you have to use a combination of types to solve puzzles as well as points where you'll need to backtrack to reach a previous unreachable bonus item such as health-increasing or mana-increasing totems. 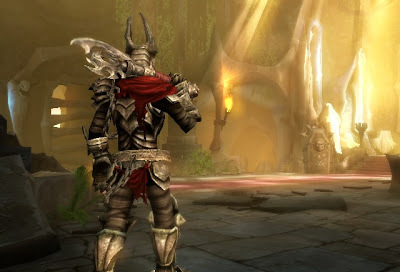 Dark Legend has you using the nunchuk and Wii remote combination to play. The pointer is used to move your minions around manually while holding the B button. You can point to enemies and press a button to have them storming towards your foes. If you feel left out, you can always join in on the action, too, as you're equipped with armor and a weapon which can be upgraded at the castle forge. Your minions will follow you automatically, or you can put up a guard marker to have them stay in position. If you'd like, you can split up your troops and command each color separately. At the start of the game you're controlling four minions, but by the end you'll have an army of twenty to pillage the land from evil that isn't your own. Your minions can smash up vases and other breakables, sometimes finding goodies for their master such as health and mana (magic) potions, gold to purchase new weapons and armor at the forge, and wearable bonuses for themselves. Life force items they collect can be used to make more minions in case any of your own should perish. Not all is right with your minions, however. They can be quite stupid at times. They might attack enemies you didn't order them to attack. Instead, you just wanted to retreat. Sometimes they won't stop attacking a boss creature until the second or third attempt to call them back. A sacrifice in the name of the Overlord. Presentation-wise, Overlord: Dark Legend is quite good. Visually the game is impressive with nice architecture, great level design, and nice lighting, but it's not all without a problem here and there. There's some framerate issues as well as various visual bugs and loading screens through the game's various lands. The script of the game is humorous, and the dialogue and voice acting is very good. There's problems though with enemies spouting the same lines over and over again until they're disposed of. Overall, Overlord: Dark Legend is a story worth spending time with, but it may be worth only a rental for most as the game is surprisingly short-- less than ten hours. There's side-quests to participate in as well as random doodads to collect such as new magic spells and stat-increasing items, but that won't take too long to complete either. The Wii remote's pointer feels like a match made in heaven with this type of game, and with a little fine-tuning regarding minion AI, graphical glitches, and the length of the game, the developers may just have a hit on their hands the next time around. As for now, Overlord: Dark Legend is a terrific rental until it reaches a lower price. With all the news of the upcoming No More Heroes: Desperate Struggle, I realized I had neglected to put up the original review. Consider this mistake corrected as here is my review of the original No More Heroes. "If I become number one, will you do it with me?" Welcome to beautiful Santa Destroy-- a lower Californian town right on the edge of the Mexican border. You're now in the world of No More Heroes-- a "mature" open-world action game for the Nintendo Wii. Sound interesting? That's because it is. Developed by Grasshopper Manufacturer and under the lead of one of the most original developers out there in Suda 51, and you have a package that's hard to pass up. Is No More Heroes the mature game Wii fans have been clamoring for, or is it yet another third-party massacre? Ah, Travis. May you find your true path. Enter Travis Touchdown. He's an Otaku-loving, beam saber wielding, smart-mouthed punk living in a sleazy dive known as the No More Heroes Motel. I already love him. His problem? He doesn't have any money. When he meets a girl by the name of Sylvia Christel, she offers to enter him into a world, of cold-blooded assassins and high-packed action. Who could resist? Sure as hell not Travis Touchdown. The goal now is simple-- there's eleven assassins ahead of him. He has to take them down one by one. 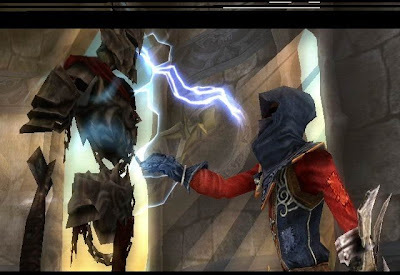 The game begins with Travis entering the villa of the number eleven ranked assassin, Death Metal, or as he's otherwise known as, the Holy Sword. Travis busts into the joint, pulls out his patented beam katana, and you're placed right into the action-- taking out guards with ease. At first I was bewildered because I was used to how The Legend of Zelda: Twilight Princess had you making swipes with the Wii remote to attack, so for about thirty seconds I was waving around the remote like I was signaling airplanes to dock at the airport. Once my intelligence caught up with me, I realized that the motion controls for this title were a little more subtle. Simply pressing A causes Touchdown to attack. You use the nunchuck obviously to move around as well as lock onto the many ruffians you need to take out. Here comes the truly gratifying part. When a goon's health bar is all the way down, you'll be prompted to move the Wii remote in a direction for the finishing blow-- either up, down, left, or right. After striking the finishing blow, you'll be treated to your enemy erupting in a glorious fountain of blood. No worries though-- fend Jack Thompson off with a hatchet. All of the violence in No More Heroes is extremely over-exaggerated. From enemies flooding out blood from their wounds to bodies exploding copious amounts of blood. The violence is almost comical in a sense. Shake the Wii remote to get the advantage! Just attacking with your beam katana though won't work forever. The katana runs on energy, and when the battery gets low through repeated attacks-- you'll need to take the Wii remote and start shaking it to charge the battery back up. 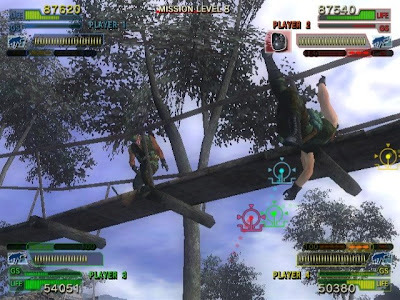 There's also non-katana attacks Travis can use such as various wrestling maneuvers-- all performed through nunchuck and Wii remote motion controls. Unfortunately they don't register all the time, but thankfully you're not penalized in any way for a mistake. The flow of the game starts simple. You gotta kill the next ranked assassin, but... you gotta get to the assassin first. Most of the bosses employ a large assortment of goons for you to slash through, so you'll be killing a bunch of lackeys so a door will unlock, and then killing a bunch of lackeys so a door will unlock. Rinse and repeat throughout the linear levels, but much like the game itself as you move on in rank you'll be treated to much more creative levels as well as boss battles. This is a game that make you think one way and then get thrown a curve ball to something completely unexpected. Shake the Wii remote to charge the battery up! After the Death Metal goes the way of Quiet Riot's career, you're going to find out the hard way that you'll need to come up with the money in order to pay the entry fee for the next ranked match. What's a broke assassin to do? Well, around the open-world confines of Santa Destroy, you'll discover plenty of jobs both legit and lethal to partake in. These range from filling up cars at the local gas station and collecting lost kittens to washing away graffiti and carefully scrounging up scorpions in the waste area. There's also less legit jobs to take such as killing as many foes as possible in a certain amount of time or taking down a target as fast as you can slice. Having to do jobs to pay for the next ranking match may irritate some players wanting to immediately jump into the next fight. No one said the way of the penniless assassin would be easy. Then there's Santa Destroy itself. The city is not meant to serve as anything but a hub to get around from place to place, so those expecting a fleshed-out GTA-inspired metropolis will surely be disappointed. Fear not though because there are dumpsters to ravage sometimes containing money or even a new shirt for Travis to wear. There's also collectibles sprinkled throughout the city in the form of Lovikov balls which can be exchanged for new abilities such as running. When running simply won't do, your main mode of transportation around Santa Destroy is Travis' trusty motorbike. Sadly though, this is a part where the game begins to lack polish. The bike controls are okay, but they could feel a lot more refined. Collision detection in the city is mediocre at best, and the visuals are the worst you'll see in the open-world portion of the game. Thankfully though if you get too far away from your bike you can call your old pal from the video store to pick up for you and drive it to your location. There's many locales to visit around Santa Destroy as well. Head to the gym to tone up, become employed at the Job Center, pick up new tapes at the video store to learn new wrestling moves, or grab a new wardrobe at Area 51. The low point of the game, but it's still not that bad. Or if Santa Destroy isn't cutting it for you, relax at Travis' hotel room where he can interact with his cat, Jeane, watch the tube, take a dump and save (seriously, that is how you save the game), or change your appearance by selecting various shirt styles, jackets, jean colors, and stylish shades. You'll need to get used to Travis' digs as you'll be returning to his place after each entry fee is paid. And paying the entry fee as fast as possible is recommended because by far the best part of No More Heroes are its incredibly thrilling boss battles. You'll come across the weirdest, most eccentric characters that have ever come out of Suda 51's mind (Killer7 doesn't count because the entire game was one huge mind-#$@^). Simple button-mashing will get you know where. You have to have patience as well as smart-timing in order to win the day. Don't be surprised if some battles have you fighting for fifteen minutes-- especially on later difficulties. The world of No More Heroes is heavily stylized. While there's noticeable graphical troubles on the hub, the indoors portions run smoothly at a steady framerate. However, sometimes you'll run across a wonky camera angle here and there. Nothing game-breaking, but it's a problem nonetheless. The voice acting is top-notch. Travis' quips are uttered perfectly as well. It's just extremely well-done. Most of the music is enjoyable also though the main theme is played way too often. The nine note phrase will get annoying after awhile. We had to face this girl more than once! Overall, No More Heroes is a fantastic action game only limited by the inclusion of the city overworld. While it's not horrible as some will lead you to believe, it is an easy-to-see error. The motion controls are subtle and for the most part work well. Your first run-through will most likely take you upwards of 10-15 hours. Then there's alternate difficulties that are only there for those who wish to play on and nothing more. No More Heroes will take your mind and make it explode-- in a good way. Just have someone clean up afterward. Despite coming out in 2007, this review is actually brand-new. I'll have another game that came out that year later this month. However, it's much bigger. That isn't to say Ghost Squad for Wii isn't worth a look, right? In 2004, a crack military unit was sent to arcades for a crime they didn't commit. They promptly escaped from a maximum security stockade to the United States underground. Today, still wanted by gamers, they survive as soldiers of fortune. If you have a problem, if no-one else can help, and if you can find them, maybe you can hire... the Ghost Squad. 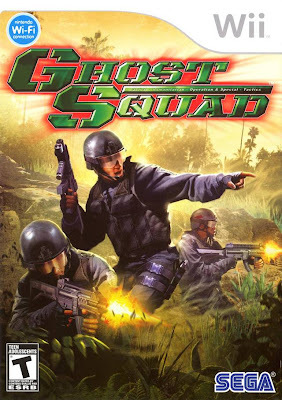 Yes, the Ghost Squad's code is to never leave a trace, and through forest retreats, presidential airplanes, and steamy jungles, the Ghost Squad intend to do just that. 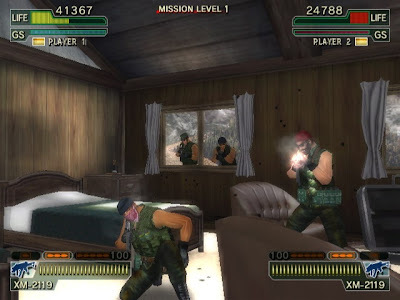 The gameplay itself of Ghost Squad is a light-gun shooter. You have no control over where you're looking-- just where you aim. 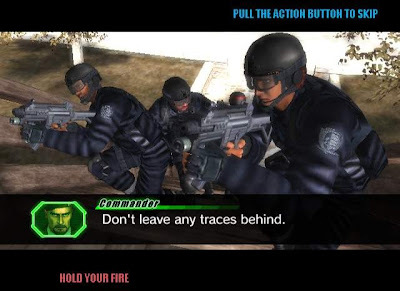 You point the Wii remote at targets, fire with the B button, and reload by pointing away from the screen. This is all the while blasting baddies to smithereens for points (head shots are worth more), collecting items in the form of health, magazine expansions, and body armor, and avoiding shooting hostages who will take health of you if you hit them. If you lose all your health, you can continue and leap back into the game albeit with points deducted from your current score. You get a Quick Shot bonus for hitting an enemy as soon as they pop up on the screen. Enemies with a flashing red target on them need to be neutralized quickly or they'll damage you. They're to be top-priority for any Ghost Squad elite. With only three missions, Ghost Squad is more about quality than quantity. Each time you successfully complete a given mission, you open up an advanced version which features more enemies in different locations as well as new choices to make in-game. When you reach a point in a level, you'll receive a choice of what action to take. You can decide to rescue some hostages, or you can be the team to defuse a time bomb. What choice you choose affects the path through the level you take. To get 100% on a mission, you'll have to complete the mission some-twenty times as well as explore all the mission's branching paths. Additionally there's mini-games of sort to accomplish where you only have a narrow window of time to complete them. 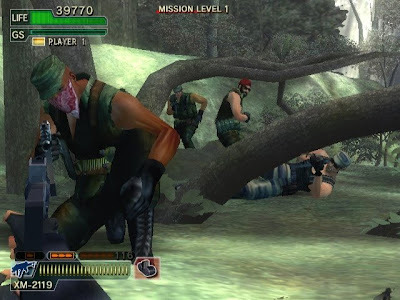 These include sniper missions where you have to take out bad dudes from afar, support missions where you try to fend off foes before they can take out your men, as well as enjoyable hand-to-hand combat where you point at the screen to block attacks before the baddie gets a shot on you. Sometimes failing these can be good, however, because they'll take you through alternate paths in the levels. At the climax of each mission, you'll have to take on a boss. These range from locking onto a copter with your homing rocket launcher to shoot it down, achieving a head shot on an escaping boss, or pelting a foe with grenades and rounds of gunfire to defeat him. It can be annoying because all of these encounters are timed or very easy to fail. This means if you fail a mission after playing through the 3-9 minutes it takes to reach him, your work is almost for naught. You have to play through the same level on a different session of playtime. Also, playing through the same three levels with little variation each time can get swiftly monotonous. At the end of each gameplay session (which takes a half hour at the most), your total points are tallied up, and you'll have the option to compare them with the rest of the world via Nintendo Wi-Fi Connection. It's as simple as offering your score to be posted, seeing if it's high enough to be placed on the leaderboard, and being done all within ten seconds or so. You also gain experience points from how well you did. Each level you gain can reward you with new guns, costumes like the cute panda costume, and new ranks. This is where the longevity comes in, and being able to play with two players is a source of near-endless fun. 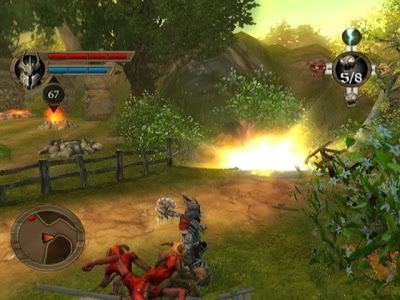 Up to four players can blast away at enemies together. Ghost Squad is a fantastic pick-up and play shooter. If you're looking for some mindless, corny entertainment, there's few games on Wii that can be beat in this regard. It's immediately accessible for newer gamers and has an acceptable amount of depth for video game veterans via the leveling system and branching mission paths. Add on the budget price, and the miniscule amount of missions isn't so bad. Ghost Squad is a recommended purchase. Welcome to a brand-new week here at SuperPhillip Central. This week we're taking a listen to the retro stylings of Mega Man II and Streets of Rage II as well as themes from We Love Golf, Wild Arms, and Killer7! We're going retro with this volume. This is the theme for the title screen of the Game Boy version of Mega Man II. The majority of the Game Boy installments combined two of the NES games into one title. Mega Man II for the Game Boy mixed elements and bosses from both the NES versions of Mega Man II and Mega Man III. This song is fast-paced and quite hummable, don't you agree? The highly versatile and renowned composer, Motoi Sakuraba brings us this fast-paced track. It plays through twice and is on the Japanese Garden course when in tournament mode. The song is part of We Love Golf! 's soundtrack, a game that sadly went under a lot of Wii owners' radars despite being made by the same team that made Mario Golf-- Camelot. Here's hoping Camelot continues making great golf and great games in general. "Huh? What in the...? Why is the car driving so slow? Something's slowing us down ..What's that on the street? Is that water? No.. No! No........ It's RAAAAAAAAAAAAAAGE!!!!" This song brings me a lot of nostalgia. I hadn't played Streets of Rage II for years, yet I still had this song in my head. It's the boss theme of Streets of Rage II. Wild Arms was the first RPG for the Playstation, and I remember wanting the game so bad just because I could name the spells. Glad I bought the game for such a silly reason because it was a blast. "Abbey" is a quaint, cozy, and jaunty track. It's a very enjoyable track that you can just lay back and bounce your head to. That does it for another week here at SP's Favorite VGMs. See you for a start of a whole new week of updates next week!